Try this fresh take on the classic mint-and-rum refresher to take your drinks to a whole new level. What do you get when you combine food, liquor, chemistry, and art? You get to deconstruct your favorite drink, to change the look and feel of ingredients, impress dinner guests, and to take your tastebuds on an adventure—also known as molecular gastronomy! Try this fresh take on the classic mint-and-rum refresher to take drinks and entertaining to a whole new level. Deconstruct mint leaves into buoyant "caviar" bubbles or a flavor-filled cloud of foam. It's even possible to encapsulate every ingredient into a sphere that explodes with flavor, introducing your tastebuds to the essence of the cocktail. Give guests a taste of the unexpected with these three easy molecular recipes that bring cutting-edge mixology to your home bar. Includes instructional booklet. Materials come from Canada, the USA, Belgium and China. Assembled in Canada. 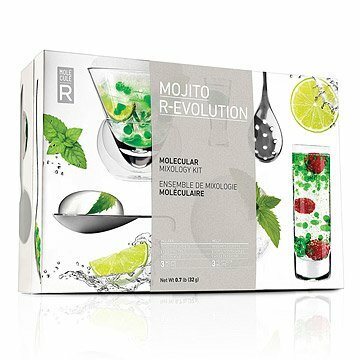 Check out our Gift Lab to see the Molecular Mixology Mojito kit in action. Check out the Food Styling Precision Tool Kit to pair with your Molecular Mixology Mojito Kit. Make it a collection with our perfect to use Molecular Gastronomy and Mixology Kits. Makes up to 300 drinks. Everyone loves a good craft cocktail, now you can make one at home in a new and exciting way! Loved the idea and the packaging but it's a bit expensive for its contents. My fiancee loves mojitos and he loves experimenting even more, so this was a win! The tools look well-made and durable, and the instructions are thorough. Can't wait to sip on some mojito bubbles! If you're looking for a neat, unexpected gift for a cocktail lover, this is it! I bought this for my brother -- who is into mixology and also getting a doctorate in a science-related field (I felt this hit the spot, for combining these 2 interests). It's definitely more thoughtful than hitting the liquor store for a bottle. I can't comment on the end product though, since it was a gift (I don't know how the actual mojito making process went). This was great! My man loves mojitos so I got this for him for Christmas. We have only made I e of this drinks so far but it was entertaining and great to spend time together doing it! You need to buy your own liquor for the mixes, that's both good and bad.. you can choose what you want, but it can make this expensive if you go top shelf. Anyways, great product! This kit makes drinking much more FUN! This product is absolutely fantastic, probably one of the coolest gifts I have ever bought for someone. It is so much fun to whip up drinks now! We had a blast. Fresh mint made this a surefire hit at the party.